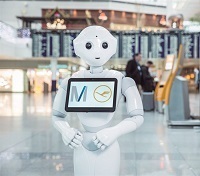 Munich Airport and Lufthansa are breaking new ground with the first-ever test in Germany of a humanoid airport robot equipped with artificial intelligence. For a limited test run, Josie is answering passengers’ questions in Munich’s Terminal 2. Directions to the gate or a certain restaurant or shop? No problem. Josie will look you in the eye and give a prompt answer, in English if that’s what is required.